Ed Reder and his team organize this unique trip to Japan. Here's our first offering of this beautiful country and we couldn't be more excited. Japan has always ranked very high on the trip surveys that we run so it's been a long time coming. Although it is known as an expensive destination, with the power of our group rates and great air contract we are very pleased at the affordablity of this offering. Our trip also coincides with Golden Week, a fairly big national holiday. Showa Day, April 29 is the birthday of former Emperor Showa, who died in the year 1989. 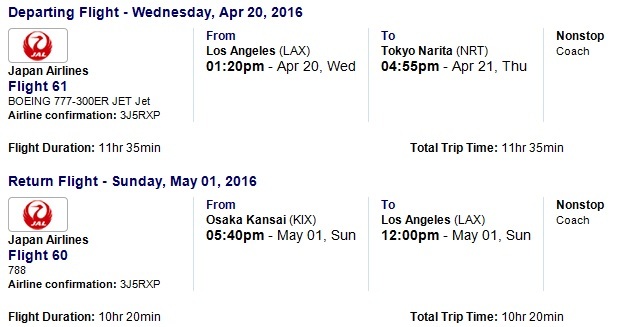 We depart the US on April 20th and arrive in Japan the afternoon of April 21st on our non-stop flight. We will have 4-nights in Tokyo to experience this amazing city. Tradition collides with pop culture in Tokyo, where you can reverently wander ancient temples before rocking out at a karaoke bar. Wake up before the sun to catch the lively fish auction at the Tsukiji Market, then refresh with a walk beneath the cherry blossom trees that line the Sumida River. Spend some time in the beautiful East Gardens of the Imperial Palace, then brush up on your Japanese history at the Edo-Tokyo Museum. Don't forget to eat as much sushi, udon noodles, and wagashi (Japanese sweets) as your belly can handle. We will have a variety of optional tours set up that we are still working on. 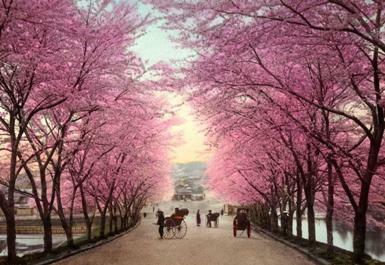 This is a perfect time of year for enjoying spring, and the cherry blossoms in full bloom so we will endeavor to bring you to the most scenic places to enjoy mother nature. We are still working with our in-bound tour operator on the tours so be patient please but trust us to make this a very special, custom trip as always. One tour that we will plan on offering is to Nikko. It is a town at the entrance to Nikko National Park, most famous for Toshogu, Japan's most lavishly decorated shrine and the mausoleum of Tokugawa Ieyasu, the founder of the Tokugawa shogunate. 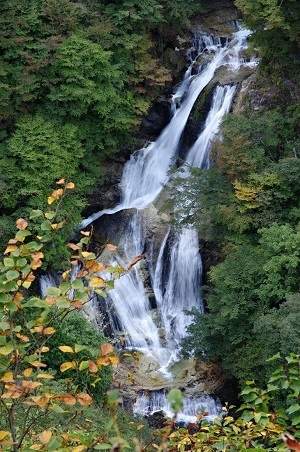 Nikko had been a center of Shinto and Buddhist mountain worship for many centuries before Toshogu was built in the 1600s, and Nikko National Park continues to offer scenic, mountainous landscapes, lakes, waterfalls, hot springs, wild monkeys and hiking trails. After our 4-days in Tokyo we will board the bullet train for the 3-hour ride to Kyoto. In route we will visit Mt Fuji, Japan's tallest mountain and active volcano. 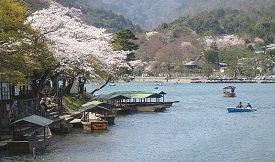 We will take a boat ride on Lake Ashinoko and experience the Komagatake Ropeway. This tour is included in the package. Kyoto has been awarded the "World's Best City" award for 2015 by Travel and Leisure magazine! It served as Japan's capital and the emperor's residence from 794 until 1868. It is now the country's seventh largest city with a population of 1.4 million people and a modern face. Over the centuries, Kyoto was destroyed by many wars and fires, but due to its historic value, the city was dropped from the list of target cities for the atomic bomb and spared from air raids during World War II. Countless temples, shrines and other historically priceless structures survive in the city today. We will offer several different tours to visit the most important places and world heritage sites. 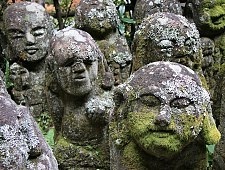 One of these sites is called Daigo-ji Temple ( see photo below). This special place spreads across Daigo-san Mountain and is well-known as the "Temple of Flowers". In 874, Godai Hall was built at the top of the mountain by Buddhist monk Shobo. Later, the garan (main complex), small buildings, and five-story pagoda were constructed at the foot of the mountain. The five-story pagoda, Goju-no-to is now the oldest building in Kyoto having survived the Onin War in the 1400's. Arashiyama a pleasant, touristy district in the western outskirts of Kyoto. The area has been a popular destination since the Heian Period (794-1185), when nobles would enjoy its natural setting. Arashiyama is particularly popular during the cherry blossom and fall color seasons. Arashiyama's famous bamboo groves and pleasure boats that are available for rent on the river. One of the most enjoyable and convenient ways to travel around the Sagano area is by rental bicycle, which are available for around 1000 yen near the train stations. Cycling through rural residential areas and past fields while traveling between temples can be one of the most enjoyable parts of a visit to Arashiyama. There is also an attractive preserved town area near the Adashino Nenbutsuji Temple. 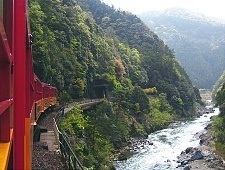 The Sagano Scenic Railway is a sightseeing train line that runs along the Hozugawa River between Arashiyama and Kameoka. Its charming, old fashioned trains wind their way through the mountains at a relatively slow pace, taking about 25 minutes to make the seven kilometer journey and giving passengers a pleasant view of the scenery as they travel from Arashiyama through the forested ravine and into rural Kameoka. Otagi Nenbutsuji Temple: Another ten minute walk north of the similarly named Adashino Nenbutsuji, the Otagi Nenbutsuji Temple is famous for its 1200 stone statues of rakan, devoted followers of Buddhism, each with a different facial expression. Created relatively recently in the 1980s and early 1990s, the many statues stand across the temple grounds which cover part of a forested mountain slope. Keage Incline is on the Kyoto side of the Lake Biwako Canal. It was once used as a rail line to connect channels. The stunning row of cherry trees along the track, which is visible to this day, represents one of Kyoto's best places to view sakura. 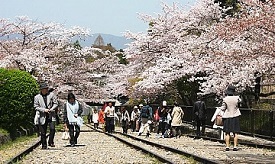 When cherry blossom season comes, crowds of people come to walk along the old railroad tracks and watch the blossoms bloom. This is one of Kyoto's sakura spots you have to visit at least once. 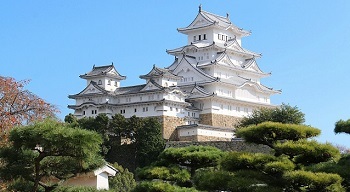 Himeji Castle is widely considered Japan's most spectacular castle. Unlike many other Japanese castles, Himeji Castle was never destroyed in wars, earthquakes or fires and survives in its original form. It is both a national treasure and a world heritage site. The castle recently underwent extensive renovation works over several years and was fully re-opened to the public in March 2015. In the 14th century, a fort was first built on the current castle site. Over the centuries, the various clans, who ruled over the region, gradually enlarged it. The castle complex, as it survives today, was completed in 1609. The well defended castle and its wooden interior are fascinating, and the castle's sight is spectacular, especially during the short and crowded cherry blossom season, that usually takes place in early April. We will send out a list of the optional tours as we get a little closer to the trip. Plus, you can always use public transit to visit some of these places. 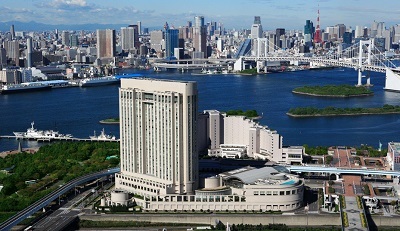 TOKYO: HOTEL GRAND PACIFIC LE DAIBA - 5 star! website, reviews - #7 out of 99! The spacious rooms at Odaiba Grand Pacific Hotel feature an elegant European style and include free wired internet access. Guests can enjoy views of Tokyo Bay in some rooms. The Grand Pacific Le Daiba Hotel is right next to Daiba Monorail Station, which provides direct access to the Shiodome area in 13 minutes. Tokyo Big Sight Exhibition Centre is 10 minutes away by monorail. The hotel provides a complimentary shuttle service to Tokyo Disney Land. A variety of shops are directly under the hotel. Guests can exercise at Le Club Fitness Centre for an extra fee, or appreciate the works at Art Gallery 21. Teppanyaki Restaurant Hamayu and Star Road Dining and Bar offer spectacular skyline views from the 30th floor. Sushi, Chinese cuisine and several bars and cafes are also available. Right in front of Kyoto Station, New Miyako Hotel features air-conditioned rooms with free Wi-Fi. The hotel has a beauty salon, a convenience shop and 6 dining options. The air-conditioned rooms come equipped with a flat-screen TV and a refrigerator. Private bathrooms feature a shower, bathtub and toiletries. Room service is available. Guests at Hotel New Miyako can find souvenirs in shopping mall Miyako Avenue, or participate in local craft workshops. Buffet restaurant Le Plaisir caters international dishes, while Shisen serves Chinese Szechuan cuisine. Restaurant Kyoyamatoya features a history of over 100 years, serving Japanese seasonal dishes. New Miyako Hotel is just a 5-minute walk from Kyoto subway station. It is a 15-minute walk from both the City Bus Terminal and Nishi Hongan-ji Temple. If you have any questions send a message to Online Support and one of our team members will contact you.